Getting up at 4:00 am is not a fun time to get up in the morning, even if you are excited about the race you’re running later that morning. I would like to thank NYRR for that 7:00 am start for the Brooklyn Half Marathon. On the way there my driver was telling me about the old New Rochelle Marathon and how his family’s lumber company would drive the lead truck for the press. One year Fred Lebow was in the back and kept banging on the roof of the truck yelling things like “slow down” and “go faster.” At one point my driver’s brother who was behind the wheel that day stopped the truck and yelled at Fred that he wasn’t going to move the truck if Fred kept banging on it. Oddly enough that got me in the mood for the race and I could’t wait to get there. I always find it a little exciting, whether I’m taking the train or a car to a race, and see all my fellow runners making their way to the start. There’s a kind of peacefulness as we all walk towards baggage check and then start doing our pre-race routines. We are indeed an odd bunch. I liked this start area much better than when I ran this race with the start in Prospect Park. In 2009, I felt the park was too small for the race. Not enough porta potties, long lines and starting corrals that just wound around and never seemed to end. This new start by the Brooklyn Museum had plenty of port potties, efficient baggage collection and better organized starting corrals. I also enjoyed the new course that only had one loop in Prospect Park. Yes, the portion of the race prior to entering the park was a bit twisty with several turns but it was really nice to be on the roads and I think gave people a better chance to cheer the runners on. I remember in 2009 feeling defeated in Prospect Park and not really knowing how much longer I had to run before we hit Ocean Parkway. I never felt that way this year. My legs felt great the whole way, no IT Band issues (thank you warm weather) and no tendon issues on the top of my foot. I ran well and never felt worn out. Of course this means I probably could have pushed myself harder and that maybe I played this a little safe. I still find it a little amazing that 13.1 miles doesn’t seem like a daunting distance any more. This ended up being my second best half marathon and I was four minutes off of my PR from Philadelphia in 2009. This was the race I was hoping to have in Miami but I’m glad I got to have this yesterday as well. The weather was great, the course was fun, and Brooklyn Borough President Marty Markowitz said he wants to look like NYRR CEO Mary Wittenberg. I’ve got a few more races coming up but nothing that I have to set out a real training plan for. So it will be nice to have the next couple of months off from training. I’ll sit down and plot my NYC Marathon training which will start in mid-July. 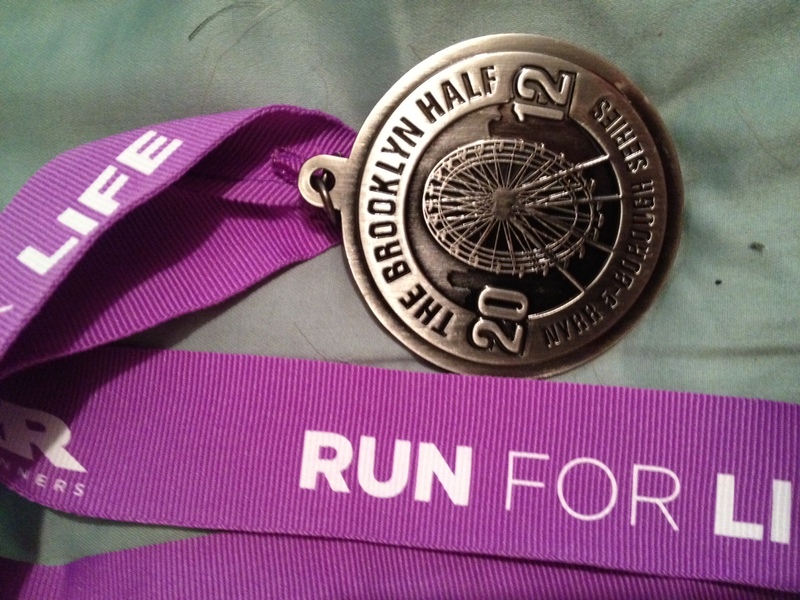 This entry was posted in Half Marathons, Races, running and tagged Brooklyn Half Marathon, NYRR, Running, training. Bookmark the permalink.